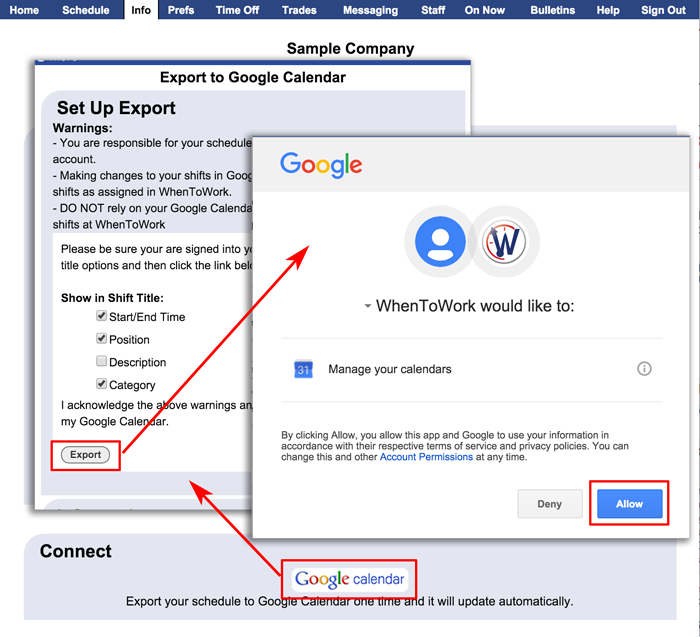 You can create an export to your Google Calendar that will send an export and maintain a current copy of your schedule at Google Calendar. Do not edit your shifts in any way - making changes to your shifts in Google Calendar has NO EFFECT on your shifts and can prevent them from being updated properly. Before beginning, be sure you are signed into your Google account. This will delete all shifts that were previously sent for this Calendar to your Google account, and delete the calendar from your list of exported calendars. Click to confirm removal of that calendar, which will remove it from your Google calendar and anyone else's calendar that you may have shared it with. If for some reason you accidentally made shift changes in your Google calendar, or you would like to confirm no shifts were changed in Google, you can click to Resend Shifts. This will resend all past and future shifts that were previously sent to your account.